And your iPad. And your customer’s iPad. If you’ve seen my profile picture you could assume that I am getting to be an old dog, getting set in my ways. I know my sons do. And I was feeling a little bit that way until I attended Autodesk University 2013. There I got a good look at how the Autodesk cloud-based offerings in the manufacturing arena are evolving. And that got me really pumped. I saw several mechanical engineering apps for an iPad that I would have loved to have had “back in the day”. I even shared them with my son, who is studying engineering in college. While some are still in the “fun” stage for me, there is one that we are already looking to solve a customer’s needs: Configurator 360. This is a relatively young app, just hitting the streets late last year. 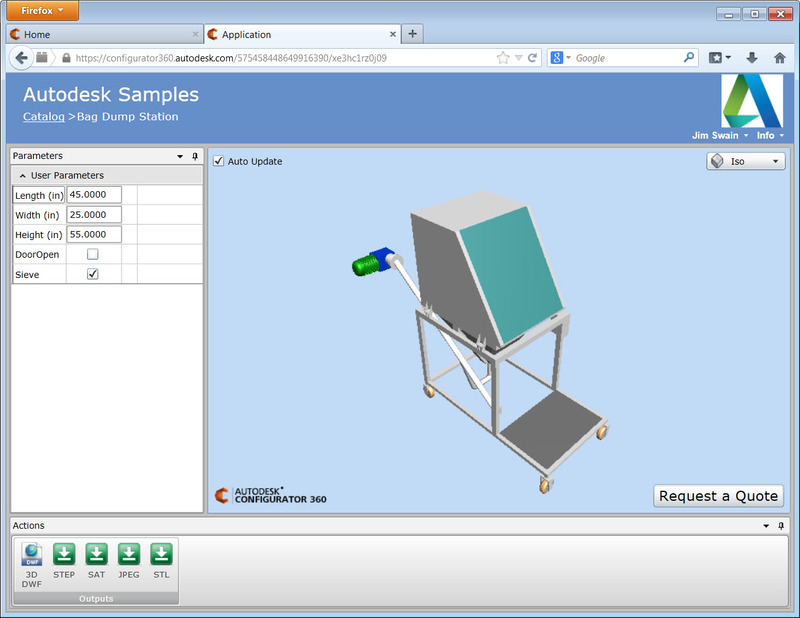 What Configurator 360 does is allows you to publish an Inventor model to the Autodesk site. This includes making some model parameters accessible to the end user. In turn the end user can view your model, tweak parameters, and finally request a quote based on their parameter settings. This can be done from a web browser, or an iPad. Sounds like going to a manufacturer’s website and spec’ing your next car, doesn’t it? But instead of a car these are Inventor models you create: regular Inventor models with parameters, iLogic driven Inventor models or even Inventor ETO models. Setting up the model is pretty straight forward, and will be the subject of my next post. I want to thank Synergis Solutions Engineer Dave Breiner for working with me as we both explore this software. I’m glad read to this blog.Very attractive and helpful info.